This was a last minute dish on Saturday to follow the fritters. We had radishes, we had snow peas. I had some mint in the garden. Why not? Crunchy, refreshing, satisfying, a fine vegetable dish. You see, I don’t ALWAYS have to throw cured pork products in (though, come to thing of it, this would be delicious with some bacon or pancetta thrown in!). When you get your CSA goods, remember that it would be hard to combine them in ways that do not go together. I wouldn’t serve blueberries and chard but for the most part all this stuff goes well side by side. Melt the butter in a saute pan over medium low heat. Add the radishes and cook gently for about 10 minutes till they’re tender. Bring a pot of water to a boil. Boil the peas till they are al dente, about 2 minutes (taste one!). Strain them and add them to the radishes. Season with salt and pepper. Serve garnished with mint and olive oil. This recipe uses familiar eatables and ”quick braising” gives a lovely, rosy hue. Thanks for the recipe/technique! I’ll have to try this with my next bunch of CSA radishes. We already ate all of our home grown radishes. They were so delicious. Love the idea to braise them. These two lovely veggies hardly need cooking, but butter makes everything better, right? Michael, If you know how to login and see your database files, you would most like see your post there. Typically done through your hosting providers Control Panel for your account. Great timing too…I did just get a bunch of radishes; way too many for garnishing a salad…and picked up a bag of snowpeas at Costco so I”m got an abundance of both and would never have considered doing them together, so thanks! My CSA gave us sugar snap peas, radishes, green onions, and fresh dill, and a recipe very similar to yours above. Delicious, my first time ever to saute a radish. I may never eat them any other way every again. I must saute my radishes! Looks interesting. this is a good side dish, i added some bacon and shallots. Its a keeper. Just tried this with tiny Japanese turnips and diced kohlrabi – delicious! I have always wanted to cook with radishes, until now it never tasted palitable. thanks michael , I may add shallot and bacon to enhance it a little. I have both in the garden and now I know what I am making for lunch tomorrow. Many thanks! Great idea Michael. Honestly I have never had much personal sucsses with either one and now I know why?. 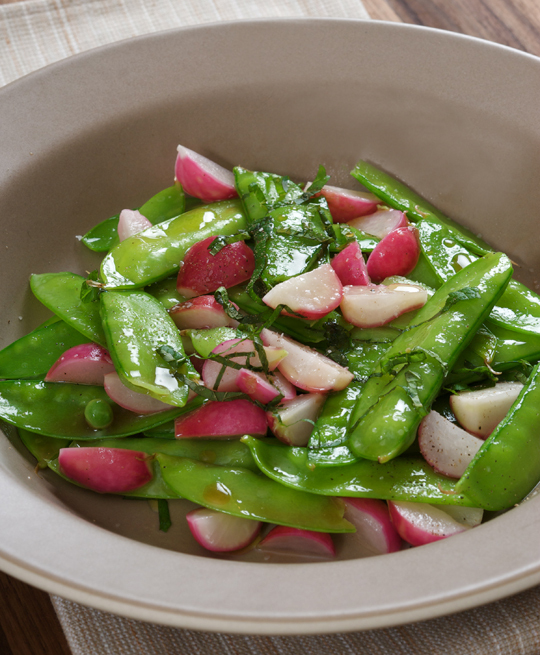 Sautee the radishes and steam the snap peas. (Ok, maybe boil… but I’d rather steam even microwave than boil. No biggy I can do it three ways and learn something in the process. My protein of choice for this is Italian sausage. The great news is that I may finally do something good with radishes. Ok, pork chops would work for me too! I totally agree that it’s hard to put two items from a CSA box together and not have it go well together – it’s one of the secret joys of eating seasonally! I made a similar dish with my CSA veggies, but it was peas plus carrots and turnips instead of radish, but the same concept. It’s the bottom of this post – http://bit.ly/cffBco. Of course, we’re in California so we got the peas in our box two months ago! I love how you’re posting about your CSA box cooking – please keep posting about it! Food prepared by you looks very healthy. Taste……? I don’t know. But certainly it is very nutritious. I was thinking the opposite– this looks like it’s swimming in butter! This is the way I have been cooking this Summer. I grab whatever looks good at the farmers market and throw it all together. It is hard to have a bad combination when everything is so fresh. I never would have put snow peas and radishes together, but I am sure it was delicious prepared that way. Perfect timing. I picked up some radishes and sugar snap peas at the farmers’ market on Saturday. I love sugar snaps with miso butter so I think I am going to do your recipe but add a spoonful of miso paste to the butter braise and maybe use some chives instead of the mint. I also made grilled radishes earlier this summer. I was surprised at how well they took to the grilling. Kind of mellows out their bite. I served them with a sesame mango dressing and some grilled shitakes. Miso great idea for this! Tried it a couple days ago with miso and it worked awesome. Sprinkled a mix of black and white sesame seeds and served it with hanger steak marinaded in soy, sesame oil, brown sugar, and ginger. Anyone know what to do with radish greens? Are they food or just compost? Make a nice peppery pesto by subbing your radish greens for basil! They are basically just a member of the Mustard family so, if in good shape, treat like any edible greens. If in great shape, just stir-fry when wet as you would stir-fry any great tender greens. As a mater of fact, stir-fry the radish with their greens … the way to handle thinnings from the garden (sorry, gardner, not a CSA person). Thanks for posting recipes that have no pork in them. Being Jewish, this allows me to try your recipes. So Michael, will braising the radishes break down the enzymes that cause the dreaded daylong radish burp effect? Just wondered because i loved fresh from the garden radishes with salt as a kid but in later years that’s out of the question. Hey! I just found your site and have been really loving your articles and writing style. Thanks for the inspiration! fresh. natural. always delicious fun. What a lovely dish! I am also cooking through my CSA experience (and am a novice cook!) and happened upon your blog. I look forward to following along! Sounds and looks pretty yummy. Any reason the peas couldn’t be braised with the radishes? I made this dish tonight. Who knew radishes could taste so good braised in butter and what a great combination with snow peas and mint! Delicious! Thank you for a great idea. People normally think of radishes as merely salad fare. It is nice to see a recipe that breaks that mold.This sounds like an outstanding combination! I understand where you’re coming from, Michael, about the use of what America has come to fear – butter. It’s a fat that imparts a fantastic flavor to foods cooked in it. However, it’s a highly saturated fat and, as most know, too much saturated fat can increase one’s risk for heart disease. Note my words “too much”. It’s not that we need to eliminate all saturated fat from our diets. We just need to be more choosy about when and how much we eat of it. In your radish and snow pea dish, the butter is part of the flavor profile. Yet, there are dishes that may require a fat for sauteing, but the other flavor components of the dish are so strong that the taste of the butter is hidden. In that case, why use something that is highly saturated when, say, olive oil would be a healthier choice? I don’t think we can give up our vigilance of what fat we’re eating. Even Julia Child at the end of her life agreed that not everything had to be made with butter in an effort to protect our health. (Of course, coming from good genetic stock doesn’t hurt. With all the butter she ate, she lived past 90 years.) But we definitely can be choosier when we decide to indulge. Had a few radishes, read the post and used what I had on hand – frozen peas, dill and butter – simple and great, I never would have thought to saute radishes, that’s what make this a great food blog. Thank you for the inspiring dish.